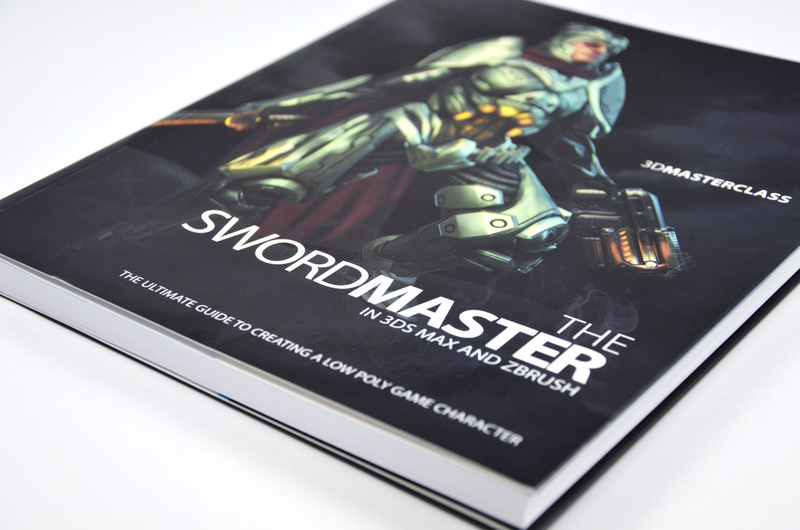 Read a Sample Chapter from 3DTotal's "The Swordmaster"
We're teaming up with the fine folks over at 3DTotal to give you a peak at a sample chapter from their latest ZBrush and 3D Studio Max book The Swordmaster. As a bonus, use promo code cgtuts25 at checkout and get 25% off any purchase from the 3DTotal Shop until August 31st! The Swordmaster in 3ds Max and ZBrush offers a truly comprehensive, step-by-step guide to modeling, sculpting, unwrapping, texturing and rendering a low poly game character. Each chapter is broken down into bite-sized steps that leave no setting or process unexplained, allowing aspiring modelers to learn at their own pace and develop a solid understanding of the character creation process. The professional workflow detailed in this book is typical of the games design industry and anyone looking to produce a portfolio-worthy character will benefit from talented character artist Gavin Goulden’s extensive experience in this field. In this portion of the series we are going to dive into the detailing phase of our model. We’ll be creating a sketch sculpt in ZBrush, hard surface modeling, detailing in ZBrush, organic sculpting and even covering the creation of our character’s accessories: his trusty sword and gun. With our model exported from 3ds Max as an OBJ, we can simply import it into ZBrush by navigating to Tool > Import and selecting the face base mesh. You can also use Subtool Master, as I will later on, to import a massive amount of models all at once (Fig.01.). Once the model is imported into ZBrush, it won’t actually be drawn in 3D space. You will need to click and drag the model on to the canvas and then enable Edit. This allows you to alter the model further; otherwise it will simply be a 2D image on a canvas (Fig.02.). I also have a few custom settings in my ZBrush. I use the default layout, for the most part, and have a set of alphas and MatCaps that I use on a regular basis, which are placed into ZBrush’s start up folder. This is just to save me from having to load the same material every time. I also have the brushes I use set to hotkeys from 1-6. These can be set by opening the Brush panel, pressing Alt + Ctrl and clicking on a brush icon. For example, I have Standard set to 1, Flatten set to 2, Pinch set to 3, Clay Tubes set to 4, Move set to 5 and Stitch set to 6. Generally, any brush I use is set to Add, using Alt to activate the reverse option, such as Subtract. After dividing the mesh a few times by pressing Ctrl + D (you can also manually add divisions in the Tool menu) I begin roughing out the facial features using the Clay Tubes brush. I generally sculpt in symmetry by pressing X. If you navigate to Transform you’ll be able to set the axis, or enable multiple axes, to be affected by symmetry. By default this is set to X. At this stage I’m not concerned about details; the goal here is to block in low frequency form information that can be read from far away (Fig.03.). Next I bring in a set of eyeballs to help keep that area crisp. This is simply two spheres that are mirrored on the X axis. Bring them in by first appending a dummy tool in the Subtool panel, then manually importing the OBJ via the Tool menu. I like to keep these as separate models within ZBrush to keep the sharp line of the eyelids intact against the eyeball. As I’ll be altering that area quite a bit it’s nice to have the eyes just retain their shape. Plus, it acts as a nice guide for eyelid volume and shape. Here I begin refining the shapes more by bringing in sharper details, like the lip edges, with a Standard brush (Fig.04.). More refining of big shapes here with a Standard brush. I tend to over-sculpt areas and tone them down during the polishing stages; this can specifically be seen in the eye and mouth corner areas. If you sculpt too much, you can easily smooth out the area by holding down Shift and brushing over the trouble area (Fig.05.). Define tighter details, but still keep it at a low frequency level and avoid going overboard with wrinkles and surface details. Then begin refining the eye area more and sharpen up the nasal folds (Fig.06.). The mouth is a touch too wide for the character’s face. Generally the corners of the mouth line up with the pupil of the eye. So let’s drop the subdivision levels to easily alter a larger space. This can be done by simply pressing Shift + D – do this and you’ll see your model become lower resolution. With the Move brush selected (not the Move Transpose tool), bring the mouth width in (Fig.07.). Now move into higher frequency detail – nothing as fine as skin pores, but getting finer details like working the edge of the lips and the flesh of the cheeks (Fig.08.). I find it really helps to sell an organic piece, especially a human face, by contrasting hard edges against an otherwise soft object. For example, in this step I’ve flattened the cheekbones, the eyelids and the bridge of the nose by using the Flatten brush. This helps the details in the face to really pop out by avoiding having all the features form one continuous “blob”. Unless you’re going for a very stylized look to your character, I would keep this sort of detail to areas that would have bones closer to the skin. Meaty areas, like the chin or nasal fold, may look odd if they are given a sharp treatment, especially when deforming during animations as you will be stretching and squashing a surface that looks stiff (Fig.09.). Add sharper edges at a lower level at the tip of the nose and the edge of the lips. Here, also add slight surface variations with a Standard brush at low intensity. This helps during lighting to show that the skin isn’t a perfectly smooth surface. Adding slight depressions, like on the chin and forehead, also shows where skin can bunch up and compress without baking too much expression in a sculpt that’s intended to be fairly neutral (Fig.10.). To help define the nostrils better, drop the subdivision levels down and move the tip of the nose inward to give the nose a natural flare. Also push the nostrils themselves in using a Standard brush (Fig.11.). Now we finally get into the finer details of the skin. Try not to go overboard with this as it can make a character look older than intended, and can make a normal map bake look muddy. There is only so much detail that can be translated in a normal map as it is all per pixel and dependent on your texture’s resolution. Lots of pores and wrinkles can all blend together during texture baking and cause the final output to look lower resolution than it actually is. So, for the most part, I like to keep my models clean and isolate detail areas. I have a few skin pore brushes that I use for character skin. These have been made from a more or less black texture with white dots scattered about. Using the Clay Tubes brush at a very low intensity, paint a few strokes over the peak areas of the skin, like the cheekbones and highest area of the cheeks. Also lightly define the eyebrows with a Standard brush, focusing on a few clumps of hair and being sure not to go overboard with the depth (Fig.12.). 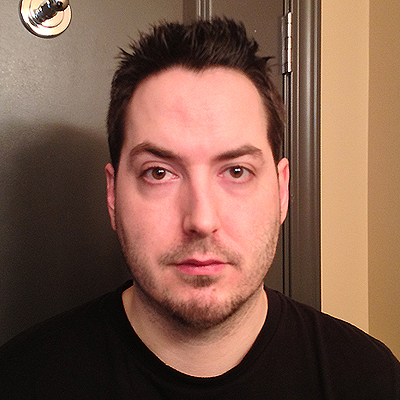 Next, add stubble by following the same steps just in Add mode and targeting the beard area. Again, be sure not to go overboard here as the end result can end up looking more like facial scaring than a five o’clock shadow. You can also add small details to help throw the symmetry of the face off, such as moles and bumps in the skin (Fig.13.). Here you can see the finer details I’ve added, such as minor scars, blemishes and wrinkles from aging (Fig.14.). There is a detail in the mood concept painting for this character that I had originally thought was a battle scar. I thought this would be a cool touch for the character to show that he’s fought before and lived to tell the tale. So, using a Standard brush, let’s cut into the skin then flatten the edges to make the cut not as sharp, to mimic skin healing in real life. Also add smaller scars coming off of this main cut to show where skin would have healed awkwardly (Fig.15.). Just like the eyeballs, import the under-armor base mesh as a subtool of the face sculpt. In the coming steps, we’ll be sculpting out an armor design, practically sketching out the armor in 3D space. Once this is complete, we will build hard surface armor chunks around this sculpt, only to bring them back into ZBrush for surface detailing. I find that this method provides a quick way to prototype ideas or work out complex shapes, and is much more forgiving than traditional modeling techniques (Fig.16.). Much like the beginning stages of the face, start blocking in the chest armor pieces and the connecting armor chunks that guard the sternum and clavicle. The main priority is to just rough out the form of the armor plates indicated in the concept drawing. There is no reason to worry about how smooth the surfaces are as we will be crossing that bridge when we build the armor plates for real (Fig.17.). At this stage, the arms are looking a touch too long, which can easily be fixed with the Transpose tool. First mask out the non-offending areas by holding down Ctrl, which activates the Masking tool, and then paint over the body. Holding Ctrl and clicking on the model will blur the mask. At the top of the screen, clicking Move, Scale or Rotate will activate the Transpose tool. In this case, let’s use a mixture of Move then Rotate. First, click the root of the deformation and then the Effector, much like a bone for animations. After this has been set, move the area up by clicking the middle circle and dragging it up some. Do the same in Rotate mode to correct the orientation of the arm (Fig.18.). After this, begin blocking in the pelvis armor pieces with the Clay Tubes brush. I find marking out the two extremes of the torso helps visualize where the limits of the midsection will be (Fig.19.). Now start blocking in the midsection/rib plates as well as the muscle definition for the arms and hands. You can also run a Flatten brush over some of the edges, especially around the pelvis, to get rid of the blobby look (Fig.20.). Now we’re going to move onto blocking in the leg armor pieces, which, I think, is the most complicated section of the armor suit as there are many different “organic” metal shapes overlapping one another. I would suggest moving up a subdivision level at this point and flattening out broad edges with the Flatten tool, using a square alpha to give a chisel-type effect. This helps make armor layers pop out from one another, which is most noticeable in the upper leg armor and will help define boundaries when we crunch the sculpt down for later use (Fig.21.). Refine the plates more, running over the separation areas with a Standard brush and smoothing out trouble areas. Also quickly rough in areas like the arm plates, the abdominal muscles and armor plate details like bigger seams (Fig.22.). Now we want to carry this method over to the back panels of the character’s armor suit. Focus on the main pieces, such as the central area and the overlapping shoulder blade pieces. You can rough in the back muscle details, but we will ultimately be tackling that in the final sculpt as one of the organic pieces like the arms and stomach. All of these pieces, like in the previous step, can simply be created by building up forms with the Clay Tubes brush, smoothing out trouble areas and flattening edges to give a sharper edge to the armor plates. Any surface detail at this point is basically just for visualization’s sake and will be tackled in the final sculpt (Fig.23.). Refine the shapes, deepening dividing lines between plates that will be built out in 3D as separate models and sharpening edges up for better compression. Like the back armor, any surface detail is just to help visualize what the final version will look like (Fig.24.). Next we are going to drop the overall polycount of the sculpt so that 3ds Max will be able to handle the model better. To do this, I recommend using the Decimation Master plugin provided by Pixologic. With the body model activated in the Subtool panel, navigate to Zplugin > Decimation Master. Here you will set the percentage that you would like to reduce your model by. You will need to select Preprocess Current and then Decimate Current. If you enable Wireframe mode by clicking the PolyFrame icon on the right side of the screen, you should see the tool become lower resolution. The difference between this and just simply lowering the subdivision levels is that Decimation Master will retain details as best it can while optimizing the rest of the mesh. Subdivisions are broader changes that can lose a lot of detail in the process. As a note, this will kill off any subdivisions you have so it is recommended that you save a backup copy of your model just in case. You can repeat this process until the model becomes a resolution that is acceptable for your machine and 3D viewport (Fig.25.). Export this new model as an OBJ and import it into Max. Interested in reading more? Head over the the 3DTotal Shop to purchase The Swordmaster and remember to use promo code cgtuts25 at checkout to save 25% on this, or any other purchase!